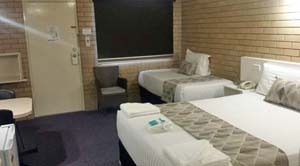 View our comfortable and affordable rooms, close to the heart of Brisbane. Our disability room has a Queen and Single Bed. Comfortably appointed, non-smoking and include large non-step en-suite bathroom, LCD flat screen TV, Microwave, toaster, Foxtel, free WiFi internet and Tea/Coffee making. Deluxe queen rooms are comfortably appointed with a Queen bed, non-smoking and include large en-suite bathrooms, LCD flat screen TV, Microwave, toaster, Foxtel, free WiFi internet and Tea/Coffee making. Standard kitchenette room has a Queen and Single Bed. Small but functional kitchenette. Comfortably appointed, non-smoking and include en-suite bathroom, LCD flat screen TV, Microwave, toaster, Foxtel, free WiFi internet and Tea/Coffee making. Standard family room has a Queen and 2 Single Beds. Comfortably appointed, non-smoking and include large suite bathroom, LCD flat screen TV, Microwave, toaster, Foxtel, free WiFi internet and Tea/Coffee making. Twin room has a Queen and Single Beds. Comfortably appointed, non-smoking and include large suite bathroom, LCD flat screen TV, Microwave, toaster, Foxtel, free WiFi internet and Tea/Coffee making.